Option to upgrade to include SeaWorld Orlando, Aquatica and Adventure Island or all-dining packages! Your visit to Busch Gardens isn't just a chance to feel connected to the land and its creatures - it's a way to be part of SeaWorld Parks’ mission. Each ticket, visit and experience help fund wildlife rescue and rehabilitation efforts, habitat protections and wildlife health initiatives. It's Christmas every day at Busch Gardens Tampa Bay with Christmas Town and is included with your admission ticket. Each night, enjoy millions of twinkling lights and visits to Santa's House. Plus, beloved characters from the television special "Rudolph the Red-Nosed Reindeer" return for some festive fun. Enjoy Yuletide shows, delicious holiday treats and much more. As one of the largest zoos in North America, Busch Gardens Tampa provides an unforgettable experience for the entire family. The park is home to 12,000 animals representing more than 250 species. From alligators and elephants to hippos and hyenas, there is a huge variety of animals to see — and get close to. In fact, Busch Gardens brings guests face to face (literally) with more exotic and endangered species than any attraction outside of Africa. Fly above the trees on a zip line and try your strength in a tug of war with a Bengal tiger in Jungala. The park’s large collection of roller coasters makes it Florida’s top spot for thrill rides. Try SheiKra, the first dive coaster in the country. Take a ride on Cobra's Curse - The one-of-a-kind spin coaster features a menacing 30,000-pound snake king icon and a 70-foot vertical lift that will take riders within inches of its 3 foot-wide eyes and 4-foot-long fangs. During the three-and-a-half-minute ride, the coaster trains speed along at 40 mph down 2,100 feet of serpentine-like track, traveling backward, forward and then spinning freely. Experience a new spin with each ride! 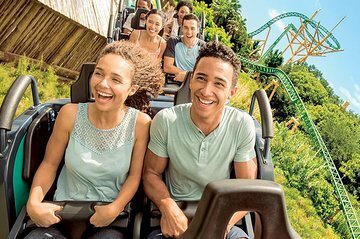 Upgrade this ticket to include admission to SeaWorld Orlando, a theme park offering more roller coasters, rides, shows, attractions and family-friendly activities for thrill seekers and animal lovers alike. See dolphins, white beluga whales and penguins. Plus visit Adventure Island Tampa or Aquatica, SeaWorld’s waterparks, with rivers to float in and enclosed tube slides. All-day dining and unlimited parking options are available for purchase. Please note: Tickets are only valid on selected date of travel. Really enjoyed our partial day there. Wished we had more time, had to catch a flight. Loved the animals and great gift shops. Paid for all day dine but didn't really have enough time to get money's worth. The hard part for us was how far we had to walk to rent a motorized wheel chair, and no transportation from handicapped or preferred parking lot to the entrance. My husband and I have mobility problems. They need to have a smaller pickup transport from the preferred and handicapped parking. We had a great time at Busch Gardens Tampa Bay. There are so many different animal exhibits and demonstrations throughout the park. We learned a lot SeaWorld's conservation efforts and rode so many rides! I loved spending the day at Busch Gardens Tampa Bay. The rides were crazy good, and the animal exhibits and educational talks were awe-inspiring. 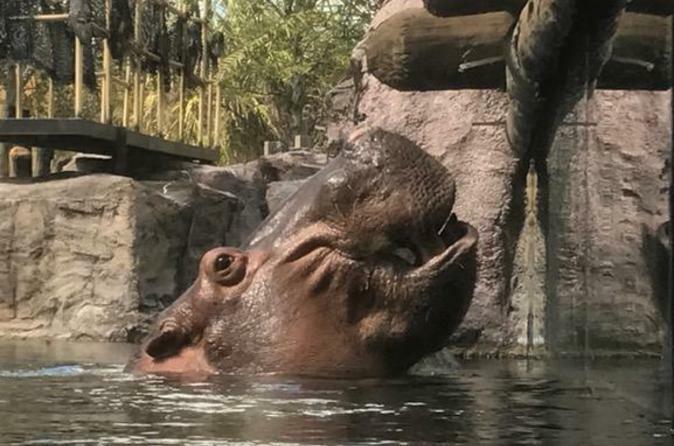 Watching a giant Hippo being fed (with above and under water viewing) was pretty amazing! Girl at ticket window wasn't sure how to process our vouchers, but a supervisor quickly showed her how. No other problems. Great park. Will visit again. Booked online in the UK through Viator, attended August 2015. Very easy site to book through just take emailed confirmation with you. Had a fantastic day out. Great place to spend a day something for everyone from seeing the animals, shows and rides. Definitely would visit again.